Made with fresh milk. 100% naturally sourced ingredients. No fruit bits. No added preservatives. No artificial colours, flavours or sweeteners. Suitable for vegetarians. 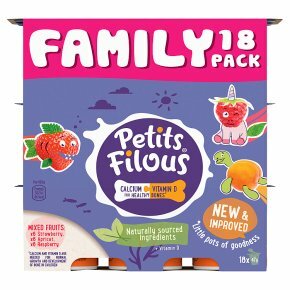 Petits Filous is the best selling Kids Yogurt and Fromage Frais brand, perfect for snacking or breakfast! Petits Filous Small Pots or Big Pots, Strawberry, Raspberry, Banana or Apricot flavour, perfect for kids of all ages! Petits Filous Fromage Frais pots contain Vitamin D & Calcium for kids strong bones to help your children kick off their morning for breakfast or end a meal as a light snack, helping them stay active all day long.